Lok Sabha Elections 2019 Highlights: Congress on Tuesday released a list of nine candidates in Kerala (2) and Maharashtra (7) for the upcoming Lok Sabha elections. With this, the party has announced the names of 146 candidates so far. Lok Sabha Elections 2019 Highlights: Congress on Tuesday released a list of nine candidates in Kerala (2) and Maharashtra (7) for the upcoming Lok Sabha elections. With this, the party has announced the names of 146 candidates so far. This time, Congress has decided to field Shanimol Usman as its candidate from Alappuzha Lok Sabha constituency, where KC Venugopal is the sitting MP. Meanwhile, the BJP Central Election Committee (CEC) meeting ended at the party headquarters in Delhi well after midnight. Ahead of the floor test to elect its state leader, Goa Governor Mridula Sinha Tuesday called for a special Assembly meeting tomorrow. Hours after Pramod Sawant took oath as the Chief Minister of Goa, he asked the Governor to summon the Assembly for a floor test on Wednesday to prove the majority of the BJP-led coalition government. Meanwhile, in Maharashtra, SP-BSP announced their alliance and declared to contest all 48 seats in Lok Sabha, while CPI(M) in West Bengal announced candidates for 38 Lok Sabha seats. The BJP Central Election Committee (CEC) meeting ends at the party headquarters in Delhi. Meanwhile, in the capital, Aam Aadmi Party made a fresh bid to forge an alliance with the Congress in Punjab, Haryana and Delhi. AAP has demanded five seats in the national capital, PTI quoted sources as saying. AAP leader Sanjay Singh discussed the proposal with NCP president Sharad Pawar. AAP wants to contest on three seats in Punjab, two in Haryana and five in Delhi. "It is now up to the Congress to take the decision. We have learnt that the party is also willing to forge an alliance with the AAP in Delhi," the sources said. The BJP Central Election Committee (CEC) meeting is still underway at the party headquarters in Delhi. The saffron party is expected to announce its first list of Lok Sabha candidates after the meeting. Congress on Tuesday released a list of nine candidates in Kerala (2) and Maharashtra (7) for the upcoming Lok Sabha elections. With this, the party has announced the names of 146 candidates so far. BJP announces that all sitting BJP candidates will lose their tickets which would include the likes of Dinesh Kashyap, Abhishek Singh, union minister for steel Vishnu Dev Sai and eight-term MP Ramesh Bais. Delhi Chief Minister Arvind Kejriwal said Congress has officially conveyed that there will be no alliance in the national capital, ANI reported. While addressing a Jan Sabha in Delhi's Laxmi Nagar, Kejriwal attacked Congress and BJP and accused them of betraying people and urged them to not vote for a prime minister, instead asked people to vote for Delhi statehood. 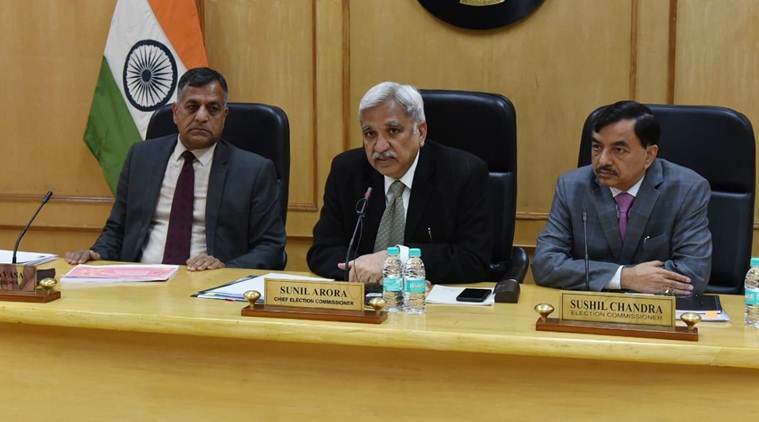 Election Commission of India has appointed civil servants Shailendra Handa and Madhu Mahajan as special expenditure observers in Maharashtra and Tamil Nadu respectively, ahead of Lok Sabha elections, ANI reported. Congress leader Priyanka Gandhi Tuesday said the reality is different from what Uttar Pradesh government has been exhibiting and there is an expiry date to the "rant" that nothing was done in the past 70 years, reported PTI. "There is a big difference between poll promises and fulfilling them. As far as the rant about (no development in) 70 years is concerned, it has an expiry date. You are in the government for the past five years, what have you done in five years?" she asked while interacting with reporters at a guest house in Bhadohi district, Uttar Pradesh. During its CEC meeting, BJP today decided to drop all 10 sitting MPs from Chhattisgarh, said BJP General Secretary Anil Jain, who is also in charge of the state, PTI reported. He said the party has decided to face the Lok Sabha elections with "new candidates and fresh energy" in order to emerge victorious under the leadership of Modi. Jain said the state BJP had made the proposal to drop the MPs to the Central Election Committee (CEC) of the party, which approved. Former Chief Minister Raman Singh is likely to be the party's candidate from Rajnandgaon, sources said. The state sends 11 MPs to the Lok Sabha. Political parties and candidates have been advised by the Election Commission to refrain from indulging in political propaganda involving activities of the Defence Forces. Jana Sena Party (JSP) releases fourth list announcing the name of a candidate for Andhra Pradesh Lok Sabha elections and eight candidates for assembly elections, according to ANI. Goa governor Mridula Sinha calls a special session of Assembly tomorrow, in the wake of a floor test scheduled for Wednesday in Goa to elect its chief minister. Hours after taking oath as the CM of Goa, Pramod Sawant Monday said he had asked the Governor to summon the Assembly for a floor test on Wednesday to prove the majority of the BJP-led coalition government. Communist Party of India (CPI) announces list of 7 candidates for the upcoming Lok Sabha elections in Tamil Nadu, Assam and West Bengal. Speaking over BSP-SP alliance in Maharashtra, Congress said the development would not have any adverse impact on the electoral prospects of the Congress-NCP combine. "Just like the Shiv Sena and the BJP, the alliance between the Congress and the NCP is sealed. Smaller outfits like the PWP and those believing in the ideology of Mahatma Phule and B R Ambedkar have joined hands with us," said NCP spokesperson Nawab Malik. "During Xi Jinping's meeting with Modi in India, the prime minister was seen sitting with him over a cup of tea without uttering a single word on the boundary dispute. Even during his (Modi) visit to China he never took up the Doklam issue," Gandhi told an election rally in the Arunachal Pradesh capital, PTI reported. Samajwadi Party chief Akhilesh Yadav said his father and party patriarch Mulayam Singh Yadav had forged an alliance with the BSP and he only ha to "mend it". Yadav further said, it is not time yet for his father to become the prime minister. 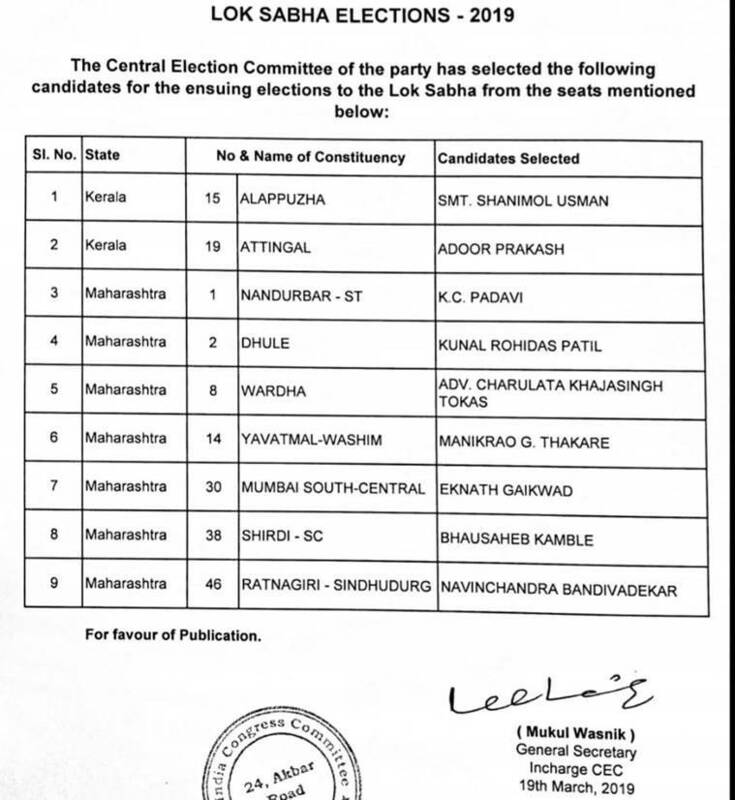 CPI(M) announces candidates for 38 Lok Sabha seats in West Bengal. Left Front chairman says there's still chance for dialogue with Congress on an alliance, PTI reported. The Left Front chairman said that they will wait till tomorrow evening for Congress's response and then announce candidates for the remaining four seats that it won in 2014. "We hope good sense will prevail and the Congress will realise the need for maximum pooling of anti-BJP and anti-TMC votes in the state. We will wait for their response," Left Front chairman Biman Bose said. The Samajwadi Party and Bahujan Samaj Party today announced their alliance in Maharashtra today, saying that they would contest all 48 Lok Sabha seats in the state. SP MLA Abu Asim Azmi said the two parties together represent about "85-90 per cent" of the society and provided a third front for people. Seat-sharing formula is yet to begin between the parties and committee has been constituted to take it further, said Azmi. Adding, he said the formula will be announced in two to three days. "Secularism is about to end in the country. Those who call themselves chowkidars can go to any length, and peddle lies, to cling on to power," he alleged. Congress chief spokesperson Randeep Singh Surjewala ridiculed Modi and other BJP leaders on adding 'chowkidaar' (watchman) before their names on Twitter saying that a watchman can be employed only by the rich. While addressing a press conference in Delhi today, Congress further reiterated that Modi is the biggest scammer in the Rafale deal, adding how in the past five years, the ruling party has failed to provide jobs to the youth, unable to help the farmers, and stole from small traders. The Delhi BJP is set to move the Election Commission against the Aam Aadmi Party (AAP) for violating the model code of conduct by attempting to incite communal intentions. Leader of Opposition in the Delhi Assembly Vijender Gupta claimed AAP's Lok Sabha candidate Raghav Chadha posted few images of a cow and its calf standing at a doorstep on Twitter titled 'Door to door campaigning by BJP' which was liked by Delhi Chief minister Arvind Kejriwal. "We have taken an appointment with the Election Commission of India and will apprise them about how the AAP is politicising cow which is a symbol of harmony and trying to create communal tension," Gupta told reporters. Stating that there will no alliance with Congress in Delhi presently, AAP's Delhi Convener Gopal Rai today said, "Congress is looking distintegrated... We can't waste any more time with them... If we ally with them now, it will be a disadvantage for us." Delhi Congress chief Sheila Dikshit and some leaders from the Delhi Congress have so far been opposed to an alliance with the AAP, while central leaders are largely in favour of it. A final call on the coalition is likely to be taken by party president Rahul Gandhi in the next few days. Delhi will vote on May 12. "PM Modi mocks the idea of mahagatbandhan but they themselves are running coalition governments in many states. We will answer BJP by winning this election." "We have decided, as soon as we form the government in 2019 we will remove the Gabbar Singh Tax and give you the GST." An FIR was registered against Union minister Jayant Sinha for allegedly violating the model code of conduct while addressing students at the convocation ceremony of a management institute here, police said Tuesday. Addressing the students at IIM-Ranchi on Saturday, Sinha had allegedly sought their "blessings" for another five years, the officer said. Jana Sena chief Pawan Kalyan will contest the upcoming Andhra Pradesh elections from Bhimavaram and Gajuwaka constituencies. His brother, Chiranjeevi, who founded the Prajarajyam Party, had also contested from two places — Palacole and Tirupati — in 2009. He had, however, lost Palacole and won in Tirupati. Rajasthan Chief Minister Ashok Gehlot Tuesday said the democracy and the Country are in danger under the present Modi government adding that the NDA will cease to hold elections if re-elected. "India may not see elections if Modi re-elected PM, may go China, Russia way," he said. 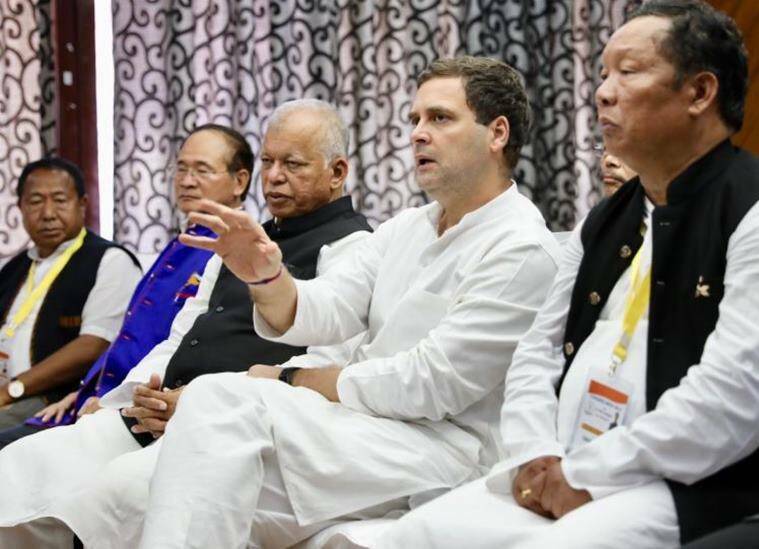 Rahul Gandhi talks of Guaranteed Minimum Income, Modi 'hugplomacy' in Arunachal. In Arunachal, Rahul Gandhi also pitched the idea of Guaranteed Minimum Income. "If Narendra Modi can give money to a selected few, Congress will give the money to youth and needy of Arunachal." Targetting the Modi-Xi "hugplomacy", Rahul said, "At the time when Modi was swinging with Xi Jinping, Chinese forces entered Doklam. But Modi stays mum. He then goes to China without an agenda. This is Modi's patriotism. We don't need this in our country"
Rahul also targetted Modi's 'Main bhi chowkidar' campaign. "How are all chors in India Modi - Nirav Modi, Lalit Modi, Narendra Modi. Earlier he used to say I didn't want to be a PM, but a chowkidar. Now he says 'Hum sab chowkidar.' But it was you who has looted the country." "Modi makes fake promises everywhere. He promised two crore jobs, but there is record unemployment in the country today. While introducing GST, Modi promised ease of business. People later realise that GST is Gabbar Singh Tax. There are five different slabs and people do not know how to fill them. We will remove this once in power." Addressing a rally in Itanagar, Rahul Gandhi said the party does not want to stifle any voices. Talking about Modi's wish of a "Congress-mukht bharat", Gandhi said, "Look at the hatred in their heart. We would only like to tell them that they are free to lead their lives by this ideology, but they cannot impose it on Arunachal Pradesh, Manipur. We will not allow this. "He also targetted PM Modi for allegedly shooting for a film at the Jim Corbet Park post-Pulwama attack. Here are some of the claims by the BJP on its #MainBhiChowkidar campaign launched by PM Modi. The information was given by IT Minister Ravi Shankar Prasad in a press conference. BSP has declared candidates on three of the 11 seats in Chhattisgarh, one in Janjgir Champa, and one each in Bastar and Kanker. While nothing has been declared officially thus far, it does seem like the BSP is continuing its assembly alliance with the Ajit Jogi's Janta Congress Chhattisgarh. BJP MLA Surendra Narayan Singh: "Mayawati ji khud roz facial karwati hain, vo kya humare neta ko kya shaukeen kahengi. Baal paka hua hai aur rangeen karwake ke aaj bhi apne aap ko Mayawati ji jawan saabit karti hain, 60 varsh umar ho gayi lekin sab baal kaale hain. (What will Mayawati say to our leaders, she herself gets facial done every day. By colouring her hairs mayawati ji proves herself to be younhg, she is 60 years old and still all her hairs are black.)" At a time when the BJP is pushing its 'MainbhiChowkidar' campaign, BJP leader and Haryana Minister Anil Vij targeted the Congress, saying they should add 'Pappu' as a prefix to their names. Congress president Rahul Gandhi on Monday said Prime Minister Narendra Modi, who sought votes in the 2014 elections to serve as “chowkidar” (watchman) of the country, is now making chowkidars of the whole of India after “he has been caught stealing”. Speaking at a rally in Kalaburagi, Karnataka, he said, “The chowkidar has been caught stealing and as soon as he is caught stealing, the chowkidar says the whole of India are chowkidars. Before he was caught, the whole of India were not chowkidars and only Modi was chowkidar.” Rahul was referring to BJP leaders and supporters designating themselves as chowkidars on social media. Priyanka, meanwhile, asked the people to “wake-up and become aware” of their rights, and that neither the government nor the country is anyone’s “jageer” (fiefdom) and hence no one should be made to beg for their rights. Without taking Modi’s name, she asked whether the promises made by one, who has the government in the country and talked of providing jobs and giving Rs 15 lakh to each account, have been fulfilled. On Monday, 47-year-old leader, took jibes at Modi's “Mai Bhi Chowkidar’ campaign“, claiming that “Chowkidars are for the rich and not the farmers”. The entourage stopped at four ghats in Prayagraj before ending day one at Sitamamarhi, another religious destination, where she was greeted with religious chantings. Before starting her 'boat-yatra' Priyanka Gandhi Vadra, wrote an open letter to the people of the state saying that she would take the help of “Gangaji” (Ganga River) to reach their doorsteps and establish “saccha samvaad” (truthful dialogue) to bring “political change”. 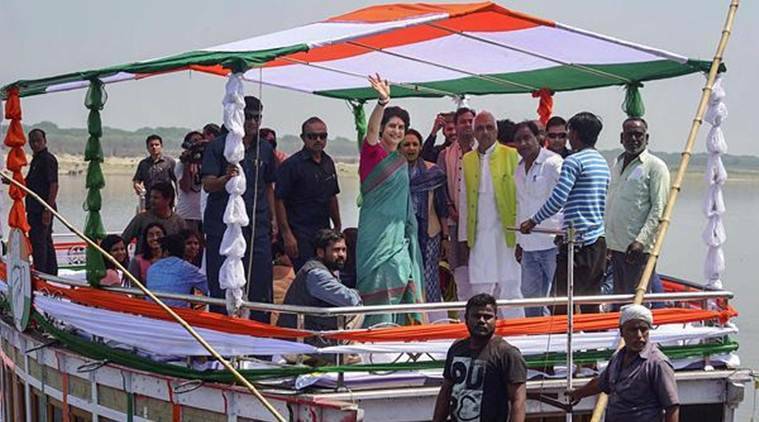 Referring to the Ganga River as the symbol of “Sacchayi” (truth) and “Sammanata” (equality) and also symbol of our “Ganga-Jamuni culture”, Priyanka said she was taking the river’s help to reach to the people. Meanwhile, Congress is still trying to chalk out the seat-sharing arrangement in Bihar and West Bengal. At stake in these two states are 82 Lok Sabha seats, crucial for the Opposition bid to upstage the BJP from power.